The saying “old habits die hard” can be especially true when it comes to changing people’s financial behaviors. Digital financial services providers know this well. Getting customers who are used to cash transactions to go digital means introducing them to new technologies — not to mention getting them comfortable with the idea of handling their personal information and money in new ways. But digital technologies can be turned from barriers to enablers of the kinds of behaviors that financial services providers want to drive. New pilots out of Paraguay and the Philippines show that automated SMS messaging can significantly change customer behaviors. CGAP partnered with mobile money providers Tigo Money (Paraguay) and Mynt (Philippines) to test a real-time, interactive, and automated SMS platform’s ability to increase mobile wallet use among customers. 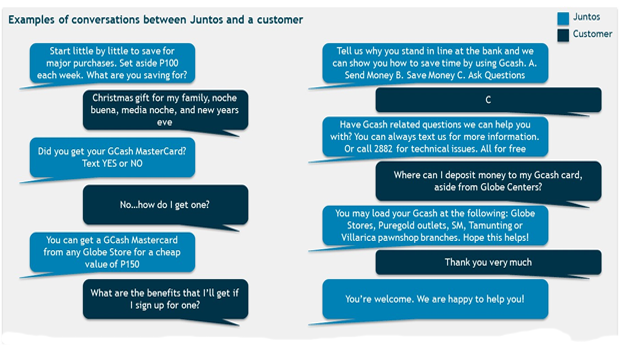 Juntos provided the platform, a two-way customer support messaging system that builds customer relationships via personalized, dynamic, and friendly conversations. The platform develops a tailored messaging strategy by iterating a series of tests to narrow down on the most successful ones. It starts by focusing on establishing relationships with customers. From there, it gives customers information about how to better use their products. The platform identifies over time which SMS communications strategies are building successful relationships and adapts to drive positive financial behavior change (in this case, increase mobile wallet use). The pilot results were impressive. In Paraguay, customers who participated in the SMS conversations showed a 21 percent increase in mobile wallet transactions after two months. In the Philippines, customers transacted 7 percent more after four months. In both cases, SMS messaging proved to be a low-cost, scalable way for providers to interact with their customers and drive key business metrics like frequency of transactions. Sharing social proof. Sharing hypothetical stories (based on real use cases) of other people successfully using their mobile wallets motivated customers to use their own wallets. Gradually increasing messaging. Customers preferred a gradual build-up of messaging. Sending more than four messages in the first week of conversation had a negative effect, while starting with one or two messages a week and then increasing the messaging frequency over time had more success. Providing exclusive information. Customers demonstrated more interest in messaging experiences that included “secret tips” as a part of the conversation, as opposed to general instructive information. Q&A. The communications strategy that achieved the highest increase in transactions established customer relationships through question-and-answer conversations that asked customers to share their financial experiences. This format personalized the conversation and distinguished it from mass-marketing campaigns. Offering choices. Customers were given the opportunity to select the language they wanted to use: English, Tagalog, and Taglish (a frequently used blend of Tagalog and English). Customers selected their preferred language and could test different options. Shaping the conversation. Customers chose the topics of conversation (saving, using Mynt socially, building a business, etc.). These tests resulted in response rates of up to 38 percent. Feeling heard. Customers were particularly engaged when asked to share their feedback about the service, the product, or why they had not been using it. They shared specific, actionable product feedback. Overall, the pilots showed the effectiveness of simple SMS messaging in changing behaviors, but they also underscored the importance of tailoring communications strategies to each market and customer group. Cultural and contextual factors mean that what works in one country may not be appropriate in another. For providers, especially global and regional players, spending the time to test and learn what works for each audience and tailoring the relationship can make a big difference. It would be helpful to know a bit more about the pilot methods. How were two groups, which led to your outcome measures, selected? Juntos and Control groups are randomly selected and checked for starting imbalance against both the population & each other. All evaluations are done on appropriately sized groups to be able to measure statistically meaningful differences. Were there any gender differences between men and women?